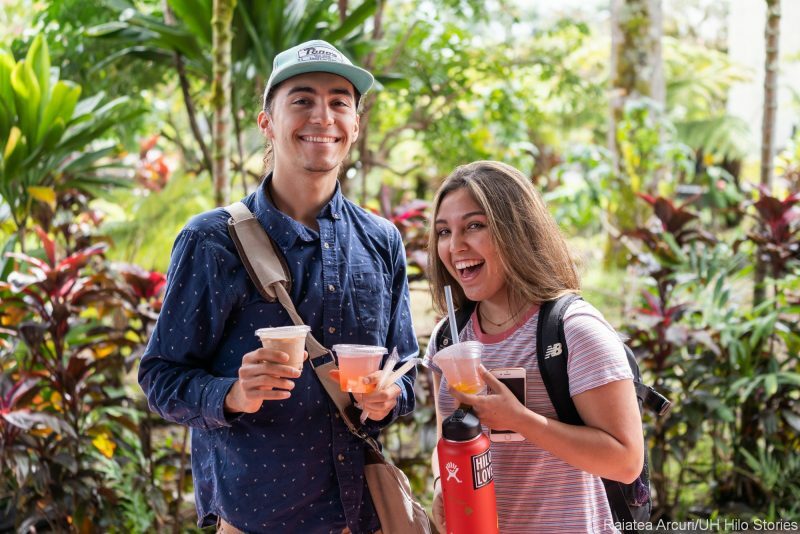 A Pop Up for Hunger Tasting Event featured the new Teapresso Bar concession, where the campus community learned more about UH Hilo’s Pop Up for Hunger program and the upcoming HALE PA’I ‘AI food pantry program to combat food insecurities at UH Hilo. Student with a beverage from Teapresso at the Pop Up for Hunger Tasting Event, March 13. Photos by Raiatea Arcuri/UH Hilo Stories, click to enlarge. 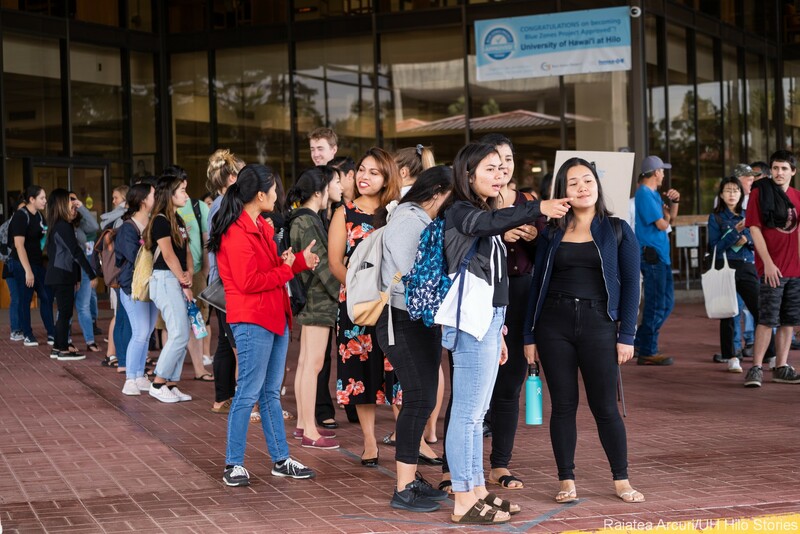 Students line up in anticipation of the Teapresso tasting event, March 13, 2019. 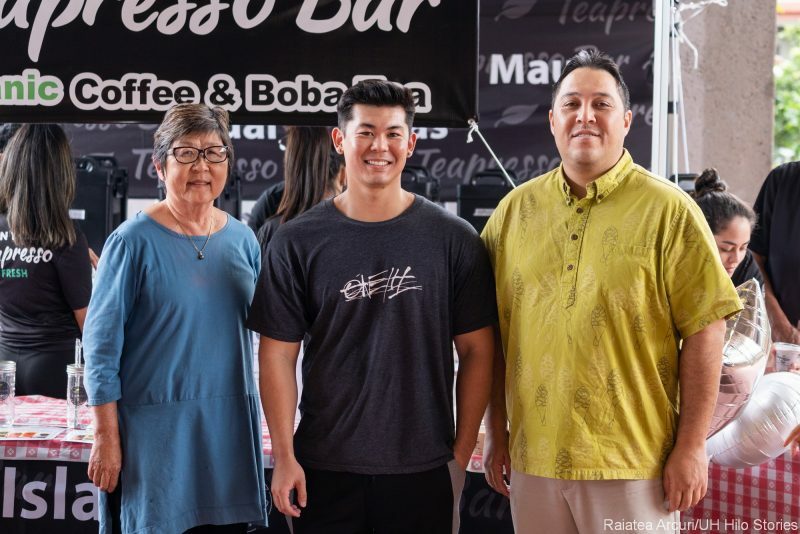 Interim Chancellor Sakai (left) served beverages at the Pop Up for Hunger tasting event, March 13, 2019. Interim Vice Chancellor for Administrative Affairs at the Pop Up for Hunger tasting event, March 13, 2019. There’s a new beverage concession on the University of Hawai‘i at Hilo campus. Interim Chancellor Marcia Sakai and Interim Vice Chancellor for Administrative Affairs Kalei Rapoza hosted a Pop Up for Hunger Tasting Event on March 13 featuring the new Teapresso Bar concession, where the campus community learned more about UH Hilo’s Pop Up for Hunger program and the upcoming HALE PA’I ‘AI food pantry program to combat food insecurities at UH Hilo. 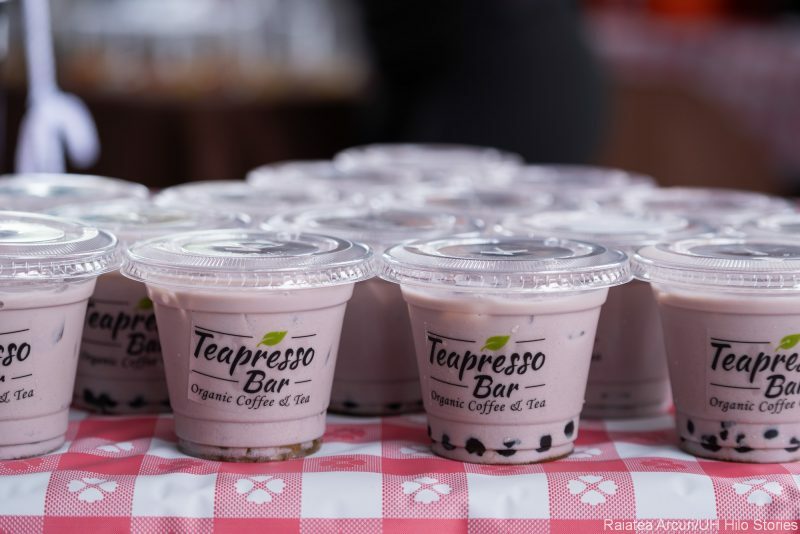 Beginning Wednesday, March 27, the campus community can get their boba tea or organic lemonade fix at the new Teapresso Bar pop up beverage concession located at the Library Lanai. 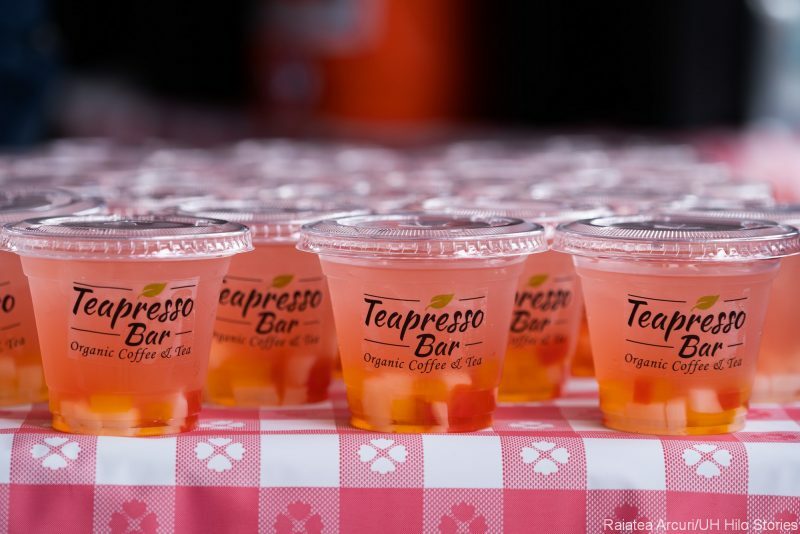 The concession will be open on Wednesdays and Fridays from 10:00 a.m. to 2:00 p.m.
Teapresso Bar’s rotating beverage menu includes Teapresso’s Signature Milk Tea, Honeydew Milk Tea, Taro Milk Tea, Tropic Osmanthus, Fruity Lychee, Rose Green Tea, Strawberry Lilikoi Lemonade, Blue Hawaiian Lemonade, and Maunakea Sunset Lemonade. Add-ons include large boba, lychee jelly or strawberry bursting boba. 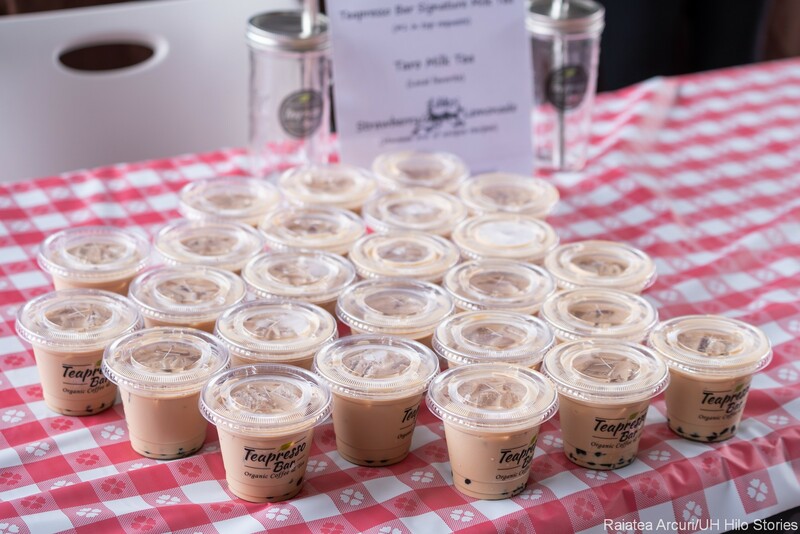 Teapresso Bar is the first beverage concession participating in UH Hilo’s “Pop Up for Hunger” program to support HALE PA‘I ‘AI, UH Hilo’s new food pantry program. 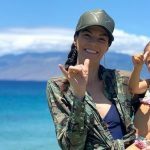 The HALE PA‘I ‘AI soft opening is planned for mid-April 2019 through the end of the semester. Administrative Affairs will operate and manage the food pantry program to serve and support any UH Hilo student without reliable access to food. 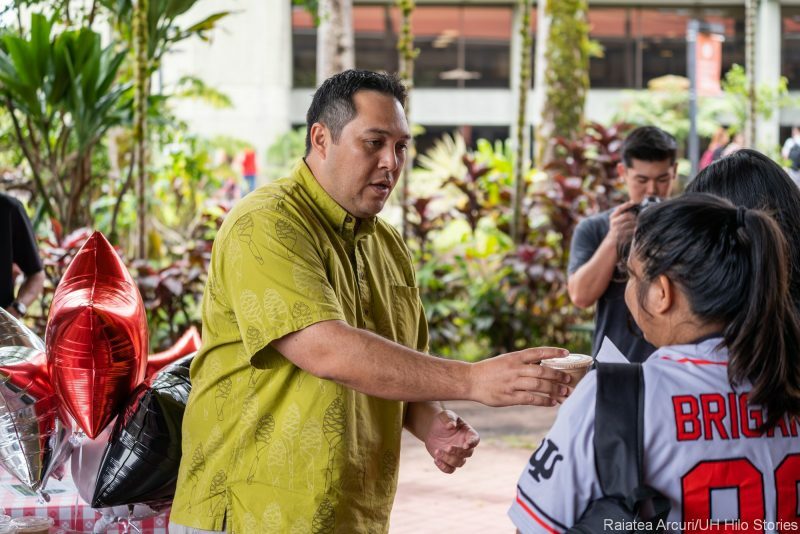 The process to receive HALE PA‘I ‘AI services is simple, and the program is set up to protect the anonymity of students with food insecurities. Any UH Hilo student in need with a valid student ID is welcome to participate in this program. 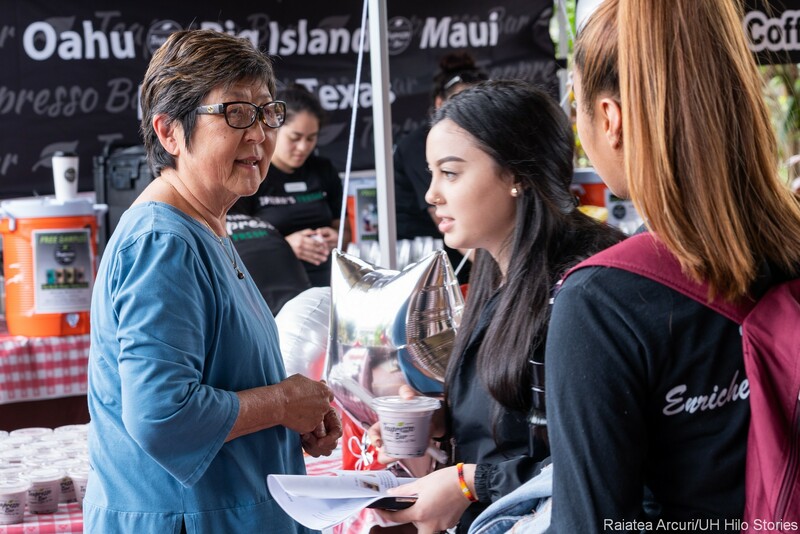 The Pop Up for Hunger concept was one of many food pantry support programs developed by UH Hilo senior Jordan Kamimura as part of a fall 2018 College of Business and Economics internship class (BUS 400). Andrey Simonov, assistant professor of accounting, oversees the course. (Left to right) Interim Chancellor Marcia Sakai, business student Jordan Kamimura, and Vice Chancellor for Administrative Affairs Kalei Rapoza at the Pop Up for Hunger event, March 13. 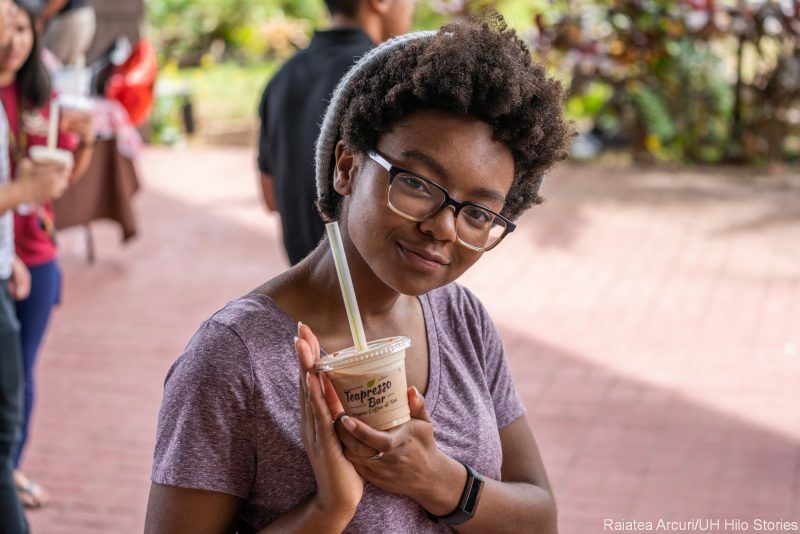 Kamimura’s internship project with Administrative Affairs included developing creative revenue generating programs and food supply sources to fund and sustain a food pantry program at UH Hilo to address student food insecurities. 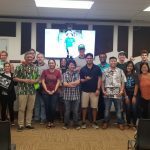 UH Hilo’s Food Service Enterprise was the primary resource and inspiration for many of the food pantry programs Kamimura researched and developed under this internship course. 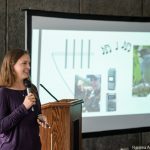 The internship project objective was to develop various revenue streams and food sources to sustain a food pantry program at UH Hilo without having to totally rely on food donations. 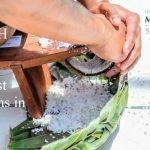 The food pantry’s name, “HALE PA’I ‘AI” eloquently describes UH Hilo’s mission to provide “a place to receive an offering of food.” Although HALE PA’I ‘AI is not intended to supply all the food a student needs for the week, it will provide supplemental food for any UH Hilo student in need of this type of support. Additional information will be provided prior to the soft opening in April. This story is adapted from an email sent from the UH Hilo Food Service Enterprise to the UH Hilo community. 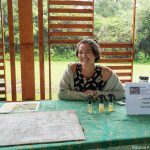 UH Hilo Stories will have more in-depth stories about Teaspresso and the HALE PA’I ‘AI program, coming soon, watch this space. Students at the Pop Up for Hunger Tasting Event, March 13.